Want to Change the World? Choose a Woman. 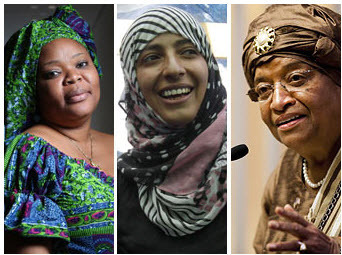 While I’m wary of broad generalizations, today’s announcement of the 2011 Nobel Peace Prize winners, a trio of women who have promoted the causes of peace, freedom, and opportunity through nonviolence, led me to a conclusion: if we really want to change the world, we need to put more women in charge. Leymah Gbowee (on the left) is a social worker and trauma counselor who organized a group known as the Women of Liberian Mass Action for Peace, a non-violent group protesting for peace that was instrumental in bringing an end to Liberia’s civil war. Tawakul Karman (center) is one of Yemen’s most vocal and well-known activists. She is also a member of the country’s main opposition party. Using social media, she organized the first student demonstrations challenging the rule of President Ali Abdullah Saleh. Ellen Johnson Sirleaf (right), a Harvard-trained economist, was elected in 2005 as President of Liberia. She was the first female democratically elected president of an African nation. She has promoted development after 14 years of civil war that devastated the country, leaving some 200,000 dead. When women lead, they tend to lead people towards health, education, and peace. Looking at the track record of men, which often leads towards war, abuse of power, and exploitation, it seems that all other factors being equal, a female leader would be preferable to a male one. This entry was posted in Uncategorized and tagged Gbowee, Karman, Men, Nobel, Peace, politics, Power, Prize, Sirleaf, Women by christao408. Bookmark the permalink. That can be true. Of course if they lack support from male politicians they can have a rough time of it… I think you are spot on in your observations with the note that women have waged war as well but usually they are more keenly aware that it is some mother’s child that is dying. If the daughters of presidents were to be in the first wave perhaps they would have been more cautious in starting military action/war. High time we elected one in our country. We had our chance last election and we blew it. Well good idea, Chris! Hopefully, we’ll do so eventually, following the footsteps of other countries. I so agree. I tell My husband all the time if more women honestly ruled, it could change things and they would be more towards peace for families and communities. Wars always tear those two things apart. I’m in complete agreement. I dream of the day when health, education, and peace permeate society around the world. @Lakakalo – I would hope that Bangladesh is the exception, not the rule. Although a 1992 book titled “Women as National Leaders” by Michael A. Genovese looked at a half-dozen case studies and found that, by an large, the women did not exercise political power differently than men. Perhaps national leadership is a less effective position to measure than, say, state and local roles? This study identifies significant differences between how male and female city managers in terms of policies, leadership styles, and priorities, arguing that females encouraged more citizen involvement and facilitated more communication. I would suspect that would lead to better results. @Ikwa – Thanks for the recommendation. Yes, I can’t imagine women leaders leading us into as many wards. @everyday_yogi – Amen. @CurryPuffy – @The_Eyes_Of_A_Painter – I can understand the hesitance some people had with Hillary Clinton, not wanting yet another dynasty, but it does seem like the US is quite far behind other nations in the matter of female leadership. Women make up 16.8% of our Representatives and 17% of our Senators. @ClimbUpTreesToLookForFish – Didn’t know that. Interesting. @murisopsis – Good point about the daughters of presidents. I think one challenge that women would have as national leaders of larger, more powerful countries would be the pressure to conform to pressures of the predominately male power structure – the military, other politicians, etc. Well I have say I strongly disagree with this.I would trust men like for example Mahatma Gandhi, Nelson Mandela, Bob Kennedy or Bernie Sanders to lead the world towards peace, health, education and prosperity much rather than women like Sarah Palin, Michelle Bachmann, Margareth Thatcher or Ann Coulter.My point being, there are a lot of people (both men and women) in the world working to change the world for the better and there are a lot of people (both men and women) working in the opposite direction…It is my firm convitction that generalizations about white people somehow being better than black people, or the other way around… or christians somehow being better than muslims, or the other way around… or men somehow being better than women, or the other way around, can only lead to prejudice, hatred and opression. In general, it does seem that women are geared toward human rights, at least more than our traditionaly male dominated socities have so far proven. Of course, as always, it depends on which man or which woman. These three women certainly give me much more hope than last years winner. In America i currently have an eye on Liiz Warren. Your site won’t let me rec, so i will add another comment, and pulse it. Don’t give Sarah Palin or Michelle Bachmann a campaign slogan, Chris!!! I remember hearing/reading somewhere that women in power tend to be stronger, tougher, more decisive and proactive than men because they have had to fight harder to reach that position of power. I think I heard this in a clip, where off the record, Nixon discusses with an ABC reporter about Golda Meyer and Indira Gandhi. If you look at what happened in the Philippines over this past decade, you’ll realize that it’s not a question of man or woman, it’s a question of person. It’s a question of people, of the populace.We have some obvious political examples in our society. Hillary Clinton – Pro War(including “All options of the table with Iran.”), Sarah Palin – Pro War, Michelle Bachman – Pro-War. As a matter of fact i can’t tell the difference between any of their views and the views of their counterparts.Lastly, i wouldn’t doubt, either, if the women selected above were not all they are cracked up to be. Remember, Obama got a Nobel peace price and all we’ve done is expand the war sinse he became President. Many tyrants, actually, have recieved the award, if you look it up. The problem is not that we need a man or woman, it’s that we need a populace who really cares about more then themselves, more often. Now, that being said, i do find it unjust that there are so few women in political positions in America, but women do make up 51% of the voting population. So you have to ask yourself why? We all have improvements to make. @Zissu25 – @jaydedheart – Thank you for your thoughtful comments. Fair enough points and as I wrote in my very first line, I’m wary of generalizations. While research on national leaders doesn’t show any particular difference between male and female politicians (over the last 200 years have there been enough women as national leaders to really draw conclusions? ), studies looking at more local levels of politicians and leadership do find a difference. At the end of the day, (as I wrote) all things being equal, I would trust a female politician more than a male politician to make choices that were better for the health, education, and nutrition of the population. But, then, there would never be a situation in real life where two candidates would be otherwise completely equal and their gender would be the only differentiator. @Dezinerdreams – Thanks for your comments. Considering how few women make it to power in male-dominated politics, it is no wonder that they either are inherently strong/tough/masculine types or at least fashion themselves to be perceived like that. Otherwise, there is little chance they will survive the fight. Perhaps a new generation of female leaders, such as Mary McAlesee (Ireland), Tarja Halonen (Finland), Ellen Johnson-Sirleaf (Liberia), Jóhanna Sigurðardóttir (Iceland), and Laura Chinchilla Miranda (Costa Rica) will see this need to “prove you are tough enough” begin to change. @an_OM_aly – Thanks for your comments. Yes, it really does depend on the individual and Elizabeth Warren has also caught my eye as someone who seems to have her focus on the right things. Thanks, too, for the “virtual rec”. I agree, Chris. Generalizations are dangerous. I do, however, agree that when there have been women in charge the agenda did seem to change to more peaceful, compassionate issues. Power seems to take a back seat and logic and reason seem to be the norm. What a concept! Way to go for posting this! i think it’s awesome that three women were recognized this year. despite what people want to claim, women still face sexist biases that put them as inferior to men. i would like to see women attain greater positions of power and leadership (and not just female ceos who have to take on masculine behavioral patterns to get to their position), both here in the u.s. as well as abroad. It’s a tough for a woman to be in politics. She’ll always be second guessed to see if she’s too soft in her decisions. So many good ideas in these responses. Generalizations are dangerous, granted, but it seems to me that being tough isn’t an inherently “bad” quality. The question I would raise is: What are you being tough about? Any change in culture/society requires tough decisions, tough choices, courage to confront the naysayers, courage to stand alone, if necessary, to defend one’s beliefs, courage to lead. These qualities I’ve seen in women and men. No human is capable of perfection, although it is a quality many strive toward. I think the realization by a leader that they have weaknesses, but try to work with their strengths to accomplish what they want to accomplish is important. Likewise, it is important for the general populance to have realistic expectations for their leaders, then demand that they lead. I think you could be right. Africa, especially, needs women to fight for their rights.